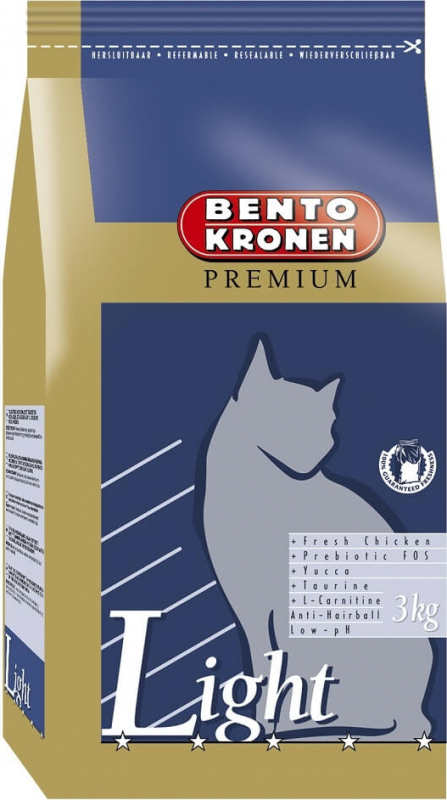 BENTO KRONEN PREMIUM Light is a balanced and complete food specifically formulated for older cats, or less active cats with a tendency gain weight (e.g. neutered cats). PREMIUM Light is a high quality food, with chicken and cereals which are easy to digest, but has a reduced calorie content. Today, about a third of all cats are overweight. Cats that are castrated, sterilised or less active, easily become too heavy and must have an appropriate diet. BENTO KRONEN PREMIUM Light contains less calories and is rich in dietary fibre. This cat food contains L-Carnitine. This natural substance promotes fat burning and supports cardiac function in older cats. Metabolisable energy: 3740 Kcal / Kg. Distribution of calories: protein 31.0%, fat 24.1%, carbohydrates 44.9%. Calcium 1%, phosphorus 0.9% , magnesium 0.09%, Vitamin A 18,000 IU / Kg Vitamin D3 1800 IU / Kg Vitamin E 120 mg / kg, copper-copper II sulfate 20 mg / kg, taurine 2000 mg / kg.